I posted last year about our attempt to makeover our backyard into a more natural play space and we've been working slowly and steadily on it since. I really wanted to make an outdoor-inspired tic tac toe game so I decided to make one using ladybugs and bumblebees and natural supplies. Sealer to protect from the elements and scratching (I used a UV Resistant Gloss Krylon clear acrylic coating). We haven't tested this yet but we also don't plan to leave them outside 24/7 so it should be fine. 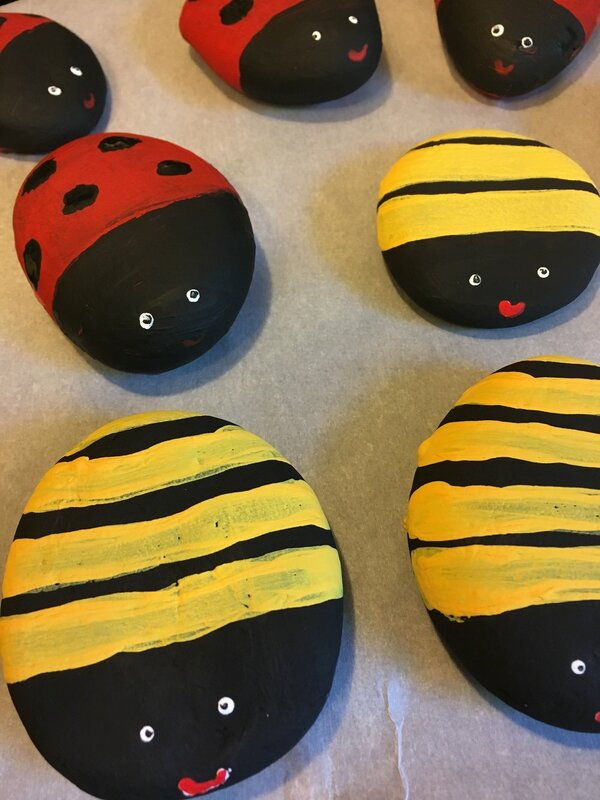 I spread out a piece of parchment paper on the kitchen counter and split the rocks into two groups -one for the ladybug team, one for the bumblebee team. First step was to cover them in their base layer of paint (red for the ladybugs, black for the bumblebees). The black only needed one good coat, the red needed about four to get even coverage but within an hour I was able to do second coats so I just picked away at it throughout the day. The bumble bees got some yellow stripes painted (again, these took a few coats and could have probably used one or two more coats than my impatient self was willing to do!). When the red was dark enough, I added a black head and black freehand dots. If you have a sponge that you can cut in a small circle that will make the dots look more uniform. Then I used a very fine brush to make white dots for the eyes, and then flipped it over and used the hard end of the brush to make teeny black pupils. I added little red smiles to them and they were done. I let them dry for several hours and during that time I went out to the yard to make a game board. I used a tree stump the kids use for a seat and measured it with a ruler to be sure the rocks could fit in the squares, and painted black lines on it. I also sprayed it with the sealer to keep it from wearing off. If you don't have a stump, you could make a game board with chalk on a driveway or on an old piece of scrap rood, making this a great game to keep in the car for lunch pit stops on the road. Once the bugs were dry I did several coats of the spray, letting them rest for about 15 minutes between sprays and then for two hours once they were fully covered. This was really a super simple project that I picked away at for a few moments at a time throughout the day but had a big pay off. The children absolutely LOVE the rocks and have been playing loads of tic tac toe games in our natural play space. The cost for us was about $7 for the spray sealer (with a coupon at Michael's). We already had craft paints and brushes from the dollar store and the rocks were free! You could make this simpler if you didn't want to make the bugs (and, trust me, those were very simple to do!) 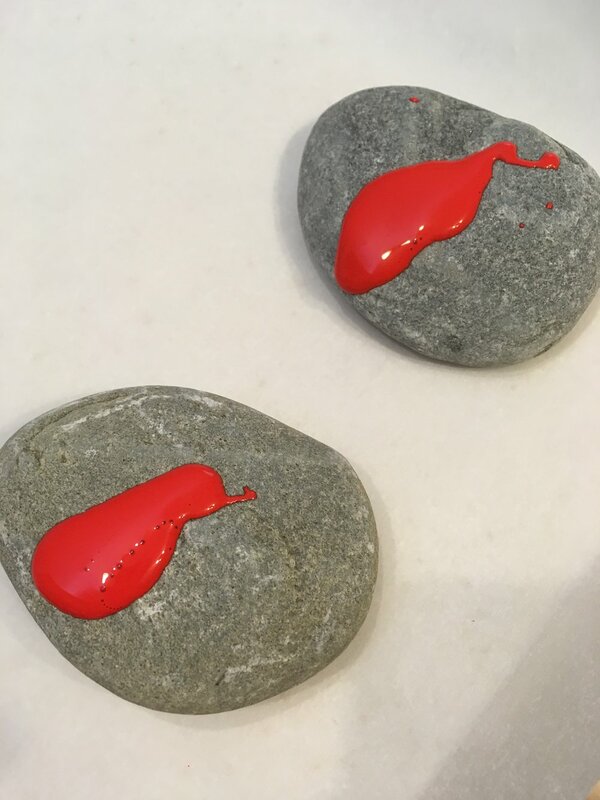 by making two different coloured rocks or just painting on an X or O on the rocks.